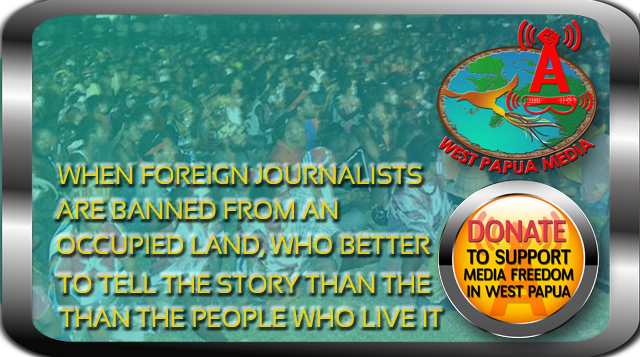 MEDIA NOTE: West Papua Media has not received any INDEPENDENT confirmation from either human rights, church or TPN sources of this contact, despite communication. In light of this, and in light of allegations of significant human rights abuses and killings of non-combabtants and civilians during this operation, it is wise to to treat military claims as unverified an not credible, unless they agree to allow independent international monitoring into the combat area. soldiers and killed one of them in the easternmost province of Papua. happened outside a village in the hilly district of Puncak Jaya. head. No information was available on the other soldiers. low-ranking soldiers for killing a civilian in Puncak Jaya last year. movement has battled for independence ever since. I am writing to you concerning the Indonesian military operation that is occurring in the Puncak Jaya regency of West Papua. Media reports have indicated that up to 600 TNI personal are involved in “sweeping “ operations in the region. In the latest incident four civilians , one women and 3 children were wounded when Indonesian troops from the Infantry Battalion 753 , who are based in Nabire fired into huts in the villiage of Kalome while searching for members of the Free Papua Movement (OPM). The incident occurred on the 12 July. These aggressive military operations in pursuit of the OPM leave the local people traumatised and in fear for their lives. Many reports have pointed out the the security forces have great difficulty distinguishing between what the term separatists and the general public. During these military operations villages are destroyed as well as gardens and livestock. While the OPM are committed to peaceful dialogue, the retain the right to self defence and protecting the local people if attacked. Although the security forces try to blame all incidents in the area on the OPM, many attacks on the TNI are by unknown attackers . Tensions are always high in the Puncak Jaya regency because of the regular military operations that occur in the area. Suspecion between the local people and the TNI remain high with the security forces accusing locals of supporting the OPM while the local people accuse the Indonesian military of human rights abuses. In May the military began a “socialising programme “ in Puncak Jaya involving up to 300 Army, Air Force and Navy personnel . The programe is proposed to run for four months and is to include the renovating of homes, churches and markets. However, local people believe it is simply a shield and a cover-up of the violation of human rights abuses that have occurred in the region. It is all reminiscent of the US programme to win the “hearts and minds of the Vietnamese people. The problems in West Papua won’t be solved by Jakarta deploying more troops to the region or conducting more military operations. In September last year the House of Representatives (DPR) Law Commission deputy chairman Tjatur Sapto Edy commenting on a report by Komnas HAM on past military operations in the PUNCAK Jaya Rregion said “there should be no more military operations and such approaches are no longer suitable in a democracy”. call on the Indonesian President to halt all military operations in West Papua and return all military personal to their barrack as a way of easing tension and saving lives. chairman Nurcholis paid a visit to the command centre of the Cenderawasih Military Command to discuss two important problems. about the situation and the families of the victims went to Komnas HAM, seeking assurances that legal processes would begin quickly. Meanwhile, there are reports that some villagers have fled their homes because of armed skirmishes between civilian forces and the TNI in Puncak Jaya. He said: ‘If this is indeed happening, we hope to solve the problem so that our activities can focus on restoring security,’ he said. Komnas HAM is checking whether the victims are civilian or military and whether the victims were wounded or have died. When asked how long this would take, Nurcholis said that he could not say. ‘The best indicator for solving human rights issues is not fixing a time frame but finding the best way to solve the problem ,’ said Nurcholis.